Neuhoff Media Lafayette radio stations WASK-FM, WKOA-FM (K-105, and WXXB-FM (B102-9) were recognized again by the Indiana Broadcasters Association for their outstanding local work with a 2018 Cardinal Community Service Award for their Riley Radiothon. 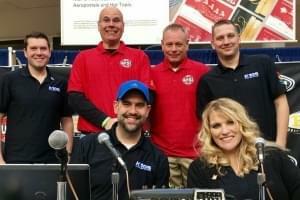 For 18-hours on January 18th and 19th the three stations broadcasted one signal on their three FM’s to raise over $53,000 for Riley Hospital for Children. This is the second consecutive Cardinal Community Service Award for Neuhoff Media Lafayette. In 2017, they were recognized for their Feed the Need Day to benefit Food Finders Food Bank.